I’m the very first to admit that when it comes to food, I’d much rather be on the eating end than the creating…it’s a lot less stressful and much more fun. As such, sushi lands in the realm of “stuff I’m never going to even attempt.” I mean, people go to school for this stuff! But Teach Me Sushi will have none of that, and recently released an app of the same name to do just that. Cooking is one of those actions that needs visuals, especially if you’re making something for the first time. Thankfully, Teach Me Sushi is chock full of them. They do us one better, even, by adding 13 in-app “action-packed videos” (which accounts for the ginormous download). So not only do you have step-by-step instructions, you also get over 45 minutes of great visual instruction that’s the next best thing to hands-on. 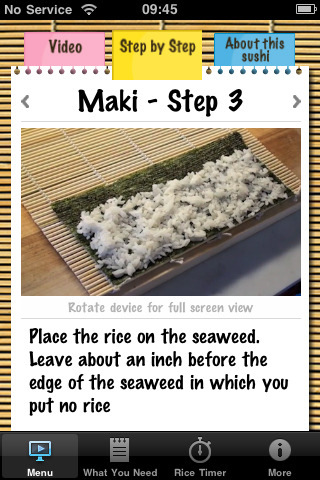 The main instructional tab is the Menu one: tap on any of the items on the list to be taken to its respective video, step-by-step instructions, and some background information on whatever roll you’re making (tap on the Menu tab to go back to the main menu at anytime). The What You Need tab lists all the ingredients and equipment, even an option to search for the nearest Japanese supermarket through Google Maps. The last tab holds the Rice Timer, which is perfect for when you’re preparing the rice. You wouldn’t normally associate making sushi with simple, but Teach Me Sushi is the exception. Each video is no longer than five minutes and the step-by-step instructions are straightforward and written so that anyone can understand. More importantly, Jake, the instructor in the videos, is highly enthusiastic, which is infectious: watching him makes me want to roll out my bamboo mats right this instance. From an aesthetic point of view, the app’s presentation is well-designed, pretty (it’s hard to not like close-up pictures of sushi), and easy to navigate. Aside from making me very hungry, Teach Me Sushi is great addition to your Apple device: it’s useful and it’s a good investment. Don’t be put off by the $4.99 price tag or the massive download session; just think of all the oishii sushi you’ll be having. AppSafari review of Teach Me Sushi was written by Julie Guan on July 7th, 2010 and categorized under App Store, Featured, Food, Reference, Video. Page viewed 5305 times, 2 so far today. Need help on using these apps? Please read the Help Page.